The Star reported yesterday about a UFO sighting in Sunway, outskirt of KL. Some people say they were just LED kites. Do you believe UFOs and ETs exist? What about the much-talked about "end of the world" predicted to be on Dec 22 this year? We have for a while now been hearing talk, been talking about it ourselves, even watching a movie, 2012, about the end of the world. 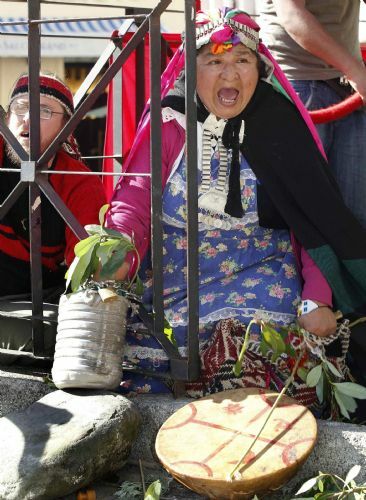 Is the Mayan calendar to be believed? 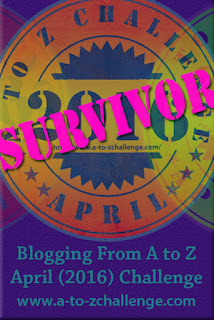 I find the end of the world a concept hard to believe but I do subscribe to 'never say never', so anything is possible. Skeptical as we may be, or at least some of us, there are signs around us that show our world falling apart - earthquakes and tsunamis, floods, global warming, and so forth. Methinks. Scientists even believe that ETs are sending us warning signs by way of crop circles, for instance. Crop circles - do you think they are man-made or made by extra-terrestrials with the aim of delivering humanity a message as to what to expect and what to do going forward? Crop circles have been appearing in the last 20 to 30 years and they are found all over the world. There was even a crop circle in Yogyakarta, Indonesia, just January of last year. Remember two suns spotted last year in China? 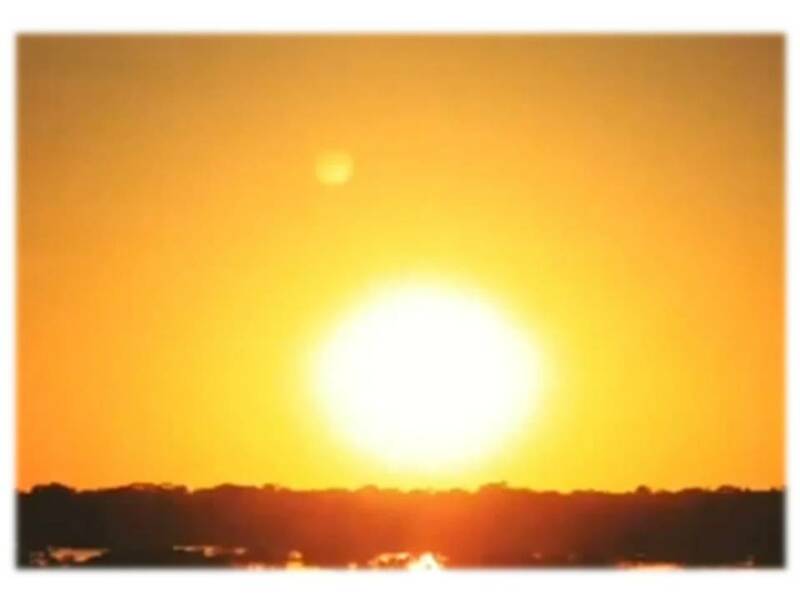 I even saw the two suns one morning in June. Something is really happening in our solar system, in space out there. Perhaps, there is some shifting going on? Do you think astral travel (astral projection) or out-of-body experience is possible? AstralWalker, Pane Andov, astral travels and he has been receiving messages from extra-terrestrials who ask that he passes them on. 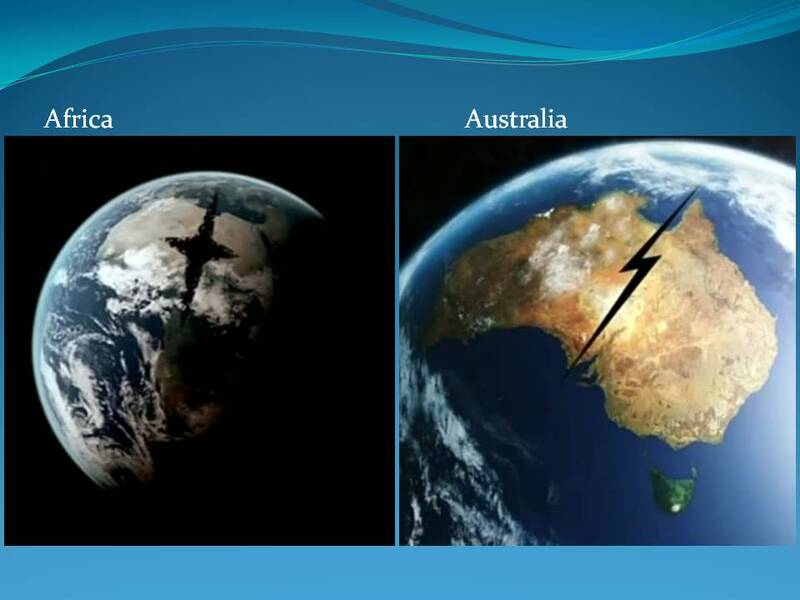 In his presentation on Expected Cosmic Events in 2012, a talk he delivered in Australia last year, he talks about crop circles, planets shifting resulting in the 'other sun' being visible on Earth, the splitting of land masses, among others. Here's the video..
Is the world coming to an end on Dec 22, 2012? Your thoughts? A drill is a useful tool to have at home. Unfortunately, I do not own a drill but most of us don't anyway. Am I right? But if I do decide to own one, I would opt for a festool c15 drill, a 15V Lithium Ion Cordless C-Drill/Driver Kit. The revolutionary EC-TEC brushless motor can easily power through over a million screws with minimal wear, not that I have a need to drill in that many screws but it certainly is good to know that it'll last should I have such a drill in my possession. The description on the website says its brushless motor is extremely energy efficient, which translates into longer run times and fewer trips to the charger. Being compact in design, it's a lot lighter and less bulky than the traditional drill. The C 15 Li can do the job of five drills. All of this power and capability packs nicely into one slim design. Believe it. 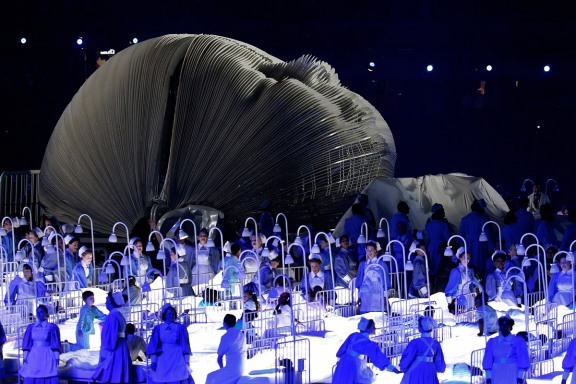 The Queen declared the London Olympics officially open, before seven young athletes were given the honour of lighting the ceremonial flame. That's right, seven young athletes lit the cauldron, a secret that was kept right up to the moment. 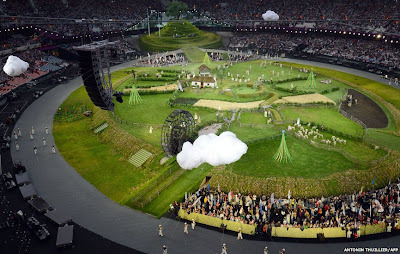 The spectacular ceremony featured British celebrities and sports people, including David Beckham and Bradley Wiggins, and screen characters Mr Bean and James Bond. More.. If you have missed the Opening Ceremony of the London Olympics, no worries as there are lots of pictures online. BBC is a great source for the Opening Ceremony pictures. More on the BBC website.. 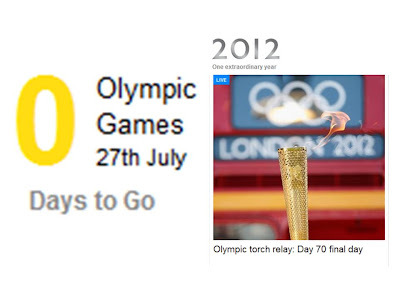 Without fail, Google keeps track of major milestones of people and events, and this time, it's the 2012 London Olympics that Google is commemorating. 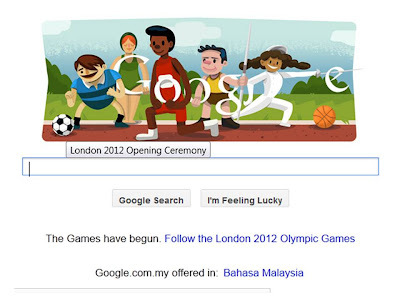 Featured above is the Google doodle dedicated to London 2012 Opening Ceremony. If you go to the Google search page, below the doodle, you will also see a link to Google's very own page dedicated to the Summer Games in London whose Opening Ceremony is scheduled to begin in 8 hours time- 9pm UK time, 3am Malaysia time. Friday Frolics - What Kind of Diner Food Are You? Someone noticed something missing today here. It's Friday and what's missing is our quiz for the week. Thank you, SK, for the tickle. While the clock is ticking towards the Opening Ceremony of the London Olympics, let's get frolicking on a personality quiz in the meantime. Let's talk about food, everyone's favourite topic, certainly. If you were food, what kind of diner food do you think you would be? Take the quiz to find out. 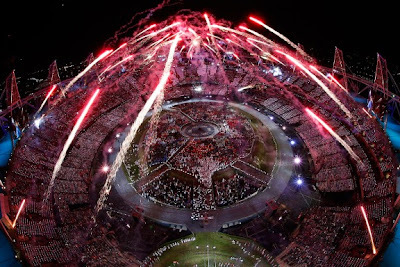 Happy Friday, everyone and enjoy the Opening Ceremony! You are old fashioned and traditional. In fact, you'd go as far as to call yourself retro. You have a strong appreciation for the classics, especially forgotten classics. Why try to invent the wheel? You prefer well established restaurants with menus that don't change. An old diner is right up your alley. You're also the type most likely to always order the same thing. Why mess with perfection? Indeed! Today is the day! The day sports fans around the world have been looking forward to - the 2012 Summer Olympics or commonly known as London 2012. The most happening place in the world right now in the context of sports has got to be London, the venue of the 2012 Summer Olympics. While a girlfriend is smack in the middle of all that London Olympics action, (she lives there and even has tickets to some of the games! ), some of us (meaning me) are happy enough just getting news from afar. BBC is doing a great job (as always) of keeping the world updated on the activities leading up to the actual Summer Games. 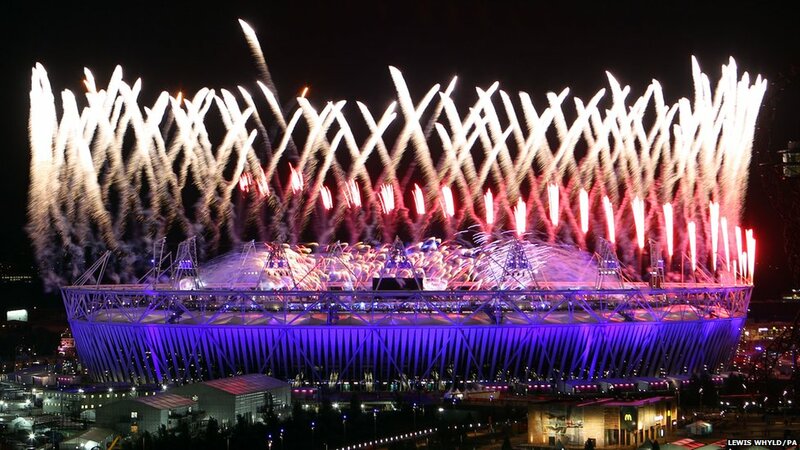 After seven years of preparation, the Opening Ceremony of the London Olympics is due to take place later at 4pm London time which is roughly about 10pm Malaysia time. The three-hour spectacle in the Olympic Stadium is expected to be viewed by a global TV audience of a billion people. The image below shows the Olympic flame heading along the Thames on the Queen's rowbarge Gloriana on the final day of the torch relay. 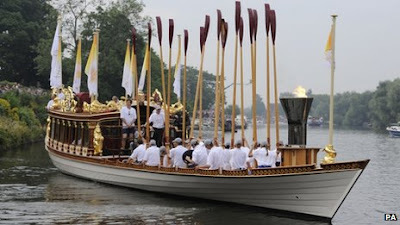 The final torchbearer of the 70-day relay will be 22-year-old basketball player Amber Charles, who played a key role in London's winning bid and who will carry the flame in front of City Hall and Tower Bridge. 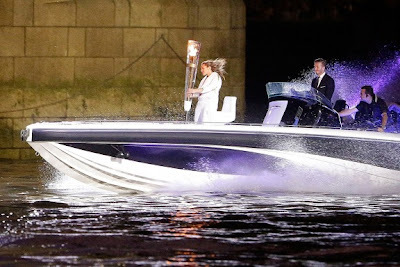 The relay ends late in the evening with the lighting of the cauldron during the opening ceremony but the identity of the person who will take on the honour remains a mystery. Will it be David Beckham doing the honours? 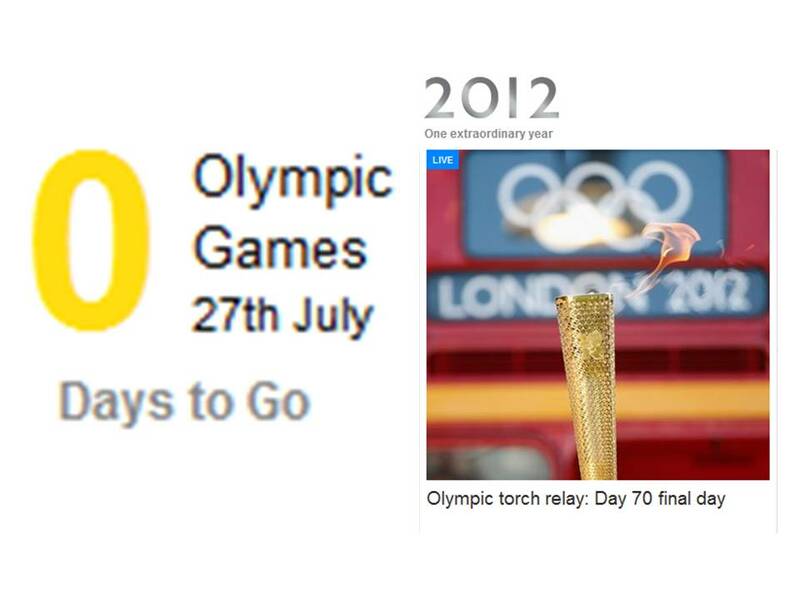 You can get more news of the London Olympics at the BBC website. In Malaysia, Astro ESPN Channel 812 will be screening it live. Looking for Pandora charms and beads? After a couple of posts about bead jewelry sometime ago, I received a number of queries in blog-comments as well as via email, as to directions to a certain bead shop in Chinatown. A writer even asked where she can get some pandora charm beads. She'd be visiting Kuala Lumpur and would like to buy some beads home. She wrote from Australia. If you are looking for beads, shopping online for them could be a convenient alternative as usually online stores do have a wider range. 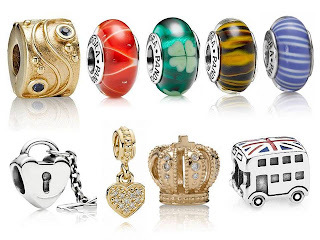 The pandora range of beads and charms comes in many different colors, themes (from abstract & patterns, to flowers & animals to birthstones & zodiac, and so forth) and styles (including Murano glass and wood) and in a range of prices to suit every budget. They form an exciting and interchangeable collection offering countless possibilities. A few samples.. The next time you visit Penang, here is one more food item to add to your food-hunt list of Penang char kway teow, asam laksa and Balik Pulau durians. 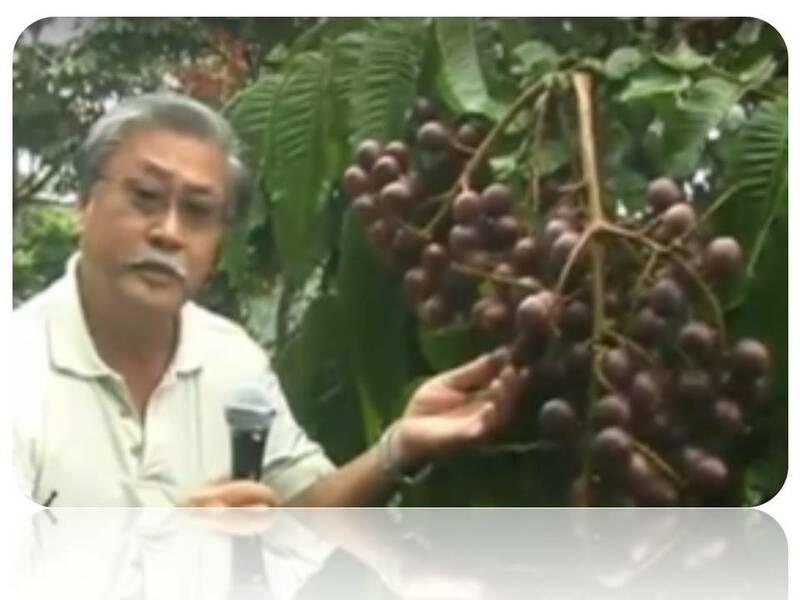 It's a new rare species of longan cultivated at the Penang Tropical Fruit Farm. It's projected to be in the market outside of the fruit farm in three to five years time. In the meantime, you can only buy them at the fruit farm. This rare longan may look like a longan but has the aroma of a durian (yum!, or may not go down too well for non-durian lovers though). The skin is green when unripe and turns black when ripe. At a glance, the ripe fruits even look like grapes on a tree. According to farm owner, Mr Quah Ewe Kheng (pictured above), this rare species of longan is known as Fijian Longan (pometia pinnata). “The seasonal longan, which tastes like rambutan with a tinge of durian, is native to the Asia-Pacific region and found mainly in the lowland subtropical and tropical areas from Sri Lanka to the Andaman Islands." The fruit matures in three to four months after flowering and its size ranges from 1cm to 4.5cm in diameter. According to Mr Quah, the masticated bark of the plant can be used to treat burns while the leaf and bark extracts can be used to treat a wide range of ailments such as diarrhea, dysentery, muscle and joint pains, colds and flu. If you are interested in planting Fijian longans, head on over to the Botanic Gardens hawker stalls in Penang this Sunday. Mr Quah will have them on sale from 9am onwards. As quantity is limited, Mr Quah advised that you contact Alison to reserve your sapling(s) to avoid disappointment. Alison can be reached at (012-4108 328). At breakfast this morning, the moms were happily talking about their babies and children, and clothes. We all (guys included) agreed that maternity dresses of today are certainly not what they used to be, frumpy and boring. Nowadays, mothers-to-be have a wide choice of better-looking maternity dresses that can take them from day to night functions. Take the dresses in the picture below, for instance. Don't they look attractive? Good enough even for the catwalk. Malaysia is sometimes known as a food heaven. The multi-ethnic society sees to it that one will be totally spoilt for choice when it comes to food. To top that, no matter what time of the day or night you need to satisfy that hunger, food is just around the corner. If you are a visitor to this country, do not hesitate to try the street food here. 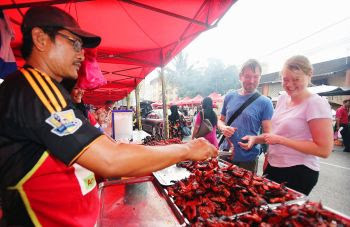 Street food is not only cheap, quick and safe, they are, in most cases, the more authentic when it comes to taste, be it Malay food, Chinese or Indian food. If you are here this time of the year, i.e., Ramadan (the fasting month), a further treat awaits you. Not to be missed in the evening is the Ramadan bazaar - usually located in parking lots or along the main street and with the trademark huge colourful outdoor umbrellas. The Ramadan bazaar is a bustling food bazaar with all kinds of cooked food for people to break their fast in the evening. The Ramadan bazaar is also popular with the non-fasting public as well as tourists. The food choice here is truly amazing, from sweet dates to a variety of local cakes to rice and noodles, chicken curry, chicken rendang, grilled mackerel and stingray, rose syrup drinks and fruit juices, all kinds of fruits (durian included) - this is just the tip of the iceberg. There are more, lots more! You simply have to experience a Ramadan Bazaar when you are here! A planned outing to the flea market at Amcorp Mall yesterday had to be called off. Something came up that my girlfriend had to take care of. It's been quite a while since our last visit to the flea market. In KL or rather the Klang Valley, the flea market at Amcorp Mall is the most true-to-the-word flea market if one is looking for knick-knacks and collectibles of times past. For coin-collectors, there is a wide choice to choose from from the many stalls dealing in coins, including US coins for sale among others. If you are looking for Malaysian coins from as far back as the Straits Settlement era, they are also available. Sprawled over several floors, Amcorp Mall's flea market is a good place to start if you are looking for antiques and collectibles. Friday Frolics - What Black-and-White Animal Are You? How many black-and-white animals can you name? If you were one such animal, which animal do you think you are? This is the personality quiz for this week. Today is the first day of the sixth lunar month and according to a prediction I read about this lunar month, (from 19th Jul to 16th Aug), this is going to be an intense month and which it’s intensity will build up very quickly. The report went on to say there will be displays of aggressive behaviour with people fighting to lead and having a strong desire for independence and freedom. 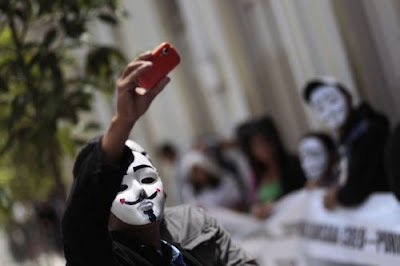 This will be caused by people’s willingness to do what it takes to achieve their objectives that will include doing the right thing as well as adopting any underhanded means. Spreading rumours, engaging in gossip, partaking in corruption or scandals might be considered and adopted. However, there will be rewards, job opportunities, good news and even money making opportunities in the midst of such misery. However such positive outcomes will not come about easily and be without conditions. A great deal of diligence, self-discipline, an eye for details, patience and perseverance will be required to work through the odds. Even though it will be necessary to work hard, it will also be vital to maintain good healthy habits and avoid being a workaholic. You might want to prioritize your tasks to handle important matters and plan your schedule properly. Failure to do so might result in a high likelihood of losing control and end up in a cycle of a cat catching its tail. Incidents recorded in The Star in the past week or so include.. 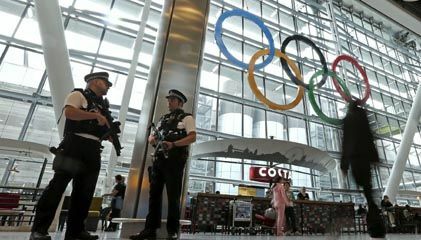 Passengers arriving for the London Olympic Games could face long queues at airports after a union representing passport officials said its members had voted to back a strike in a dispute over pay and job cuts. 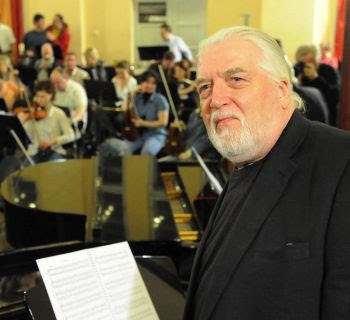 ...and something pretty for a change..
Jon Lord, keyboardist with legendary British rock band Deep Purple and co-author of their most famous hit Smoke On The Water has died aged 71, his family announced on Monday. Lord, who also played with Whitesnake, died at the London Clinic on Monday, surrounded by family, a statement said. Jonathan Douglas "Jon" Lord D.M. (9 June 1941 – 16 July 2012) was an English composer, pianist and Hammond organ player known for his pioneering work in fusing rock and classical or baroque forms, especially with Deep Purple, besides Whitesnake, Paice, Ashton & Lord, The Artwoods and Flower Pot Men. R.I.P.﻿ Jon Lord. Thank you for the music. You will be missed. My favorites from Deep Purple.. in no particular order. Enjoy! 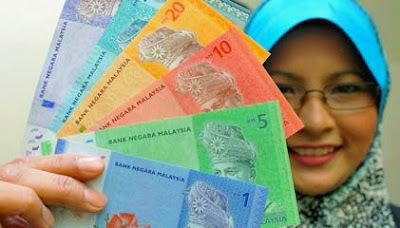 New Malaysian currency notes go into circulation today. The new notes comprise RM100, RM20, RM10, RM5 and RM1 denominations, in bright colours and motifs depicting Malaysia's cultural heritage and nature. The RM20 note makes a comeback in this series, while a new polymer substrate is used for the RM5 and RM1 banknotes. Among the enhanced security features on the new notes are a shadow image, clear window, watermark portrait with pixel and highlighted numerals, colour shifting security thread, micro lens thread, perfect see-through register and coloured glossy patch. A tactile identification feature has also been included to aid the visually-impaired to identify denominations. What do you think of the new colours? This is indeed a happening weekend in Malaysia. If the Rainforest World Music Festival is too far for you, you can join the music festival in Penang instead. Named the Northern Music Festival, this two-day affair is in conjunctions with Georgetown Festival that features more than 40 (that's forty) bands including An Honest Mistake, Cassandra, Incarnation, Love Me Butch and Monoloque. Check out the marketplace for music products and fashion stuff. Justin Bieber. Seriously.. and K-pop star, Jay Park, Korean girl group, Kara, even our very own Mizz Nina will be performing at this hot event. Or you could join Bon Odori Festival in Shah Alam. The 36th Bon Odori Dance Festival will be celebrated on July 14 (today) at the Kompleks Sukan Negara (Panasonic Sports Complex), Section 21, Shah Alam from 5pm. There will be free shuttle bus from the Shah Alam KTM station to the sports complex from 4pm to 11pm. For details, call 03-2177 2600. There you have it, plenty on the plate this weekend. This is the weekend where the jungles of Borneo come alive with song and dance. 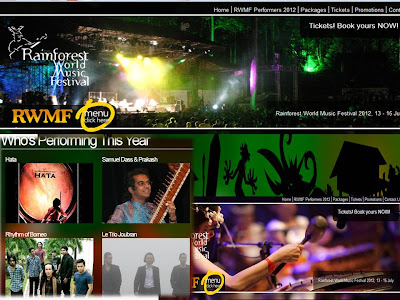 Yes, it is the time again for the Rainforest World Music Festival (RWMF), this year in its 15th year. Just as we speak, the music festival is already in full swing. The Rainforest World Music Festival, considered one of the best outdoor world music festivals in the world, is an annual three-day music festival celebrating the diversity of world music. 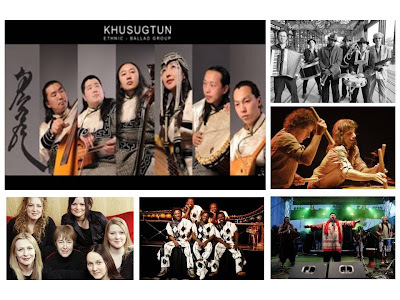 It is held in Kuching, Sarawak, East Malaysia, and includes daytime music workshops, jamming sessions with artistes and musicians, cultural displays, craft displays, food stalls, and main-stage evening concerts. Last year's event had an audience of more than 20,000. 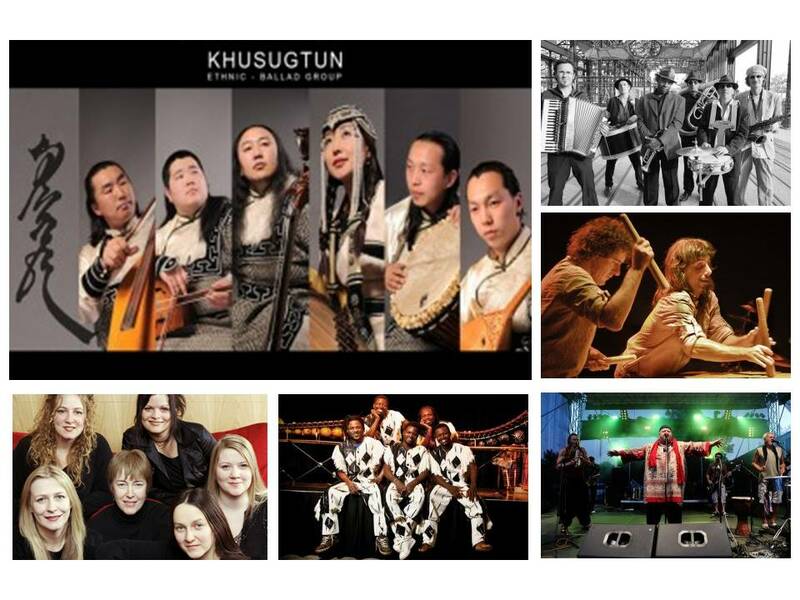 A wide range of performances are featured in this music festival from traditional music, to world fusion and contemporary world music. The festival emphasizes the use of traditional acoustic world instruments, although electric accompaniment instruments are common. Invited performers come from near and far - from Sarawak, other provinces of Malaysia, and countries near and far including Palestine, Czech Republic, Mongolia, Brazil. - Local groups including Diplomats Of Drum, Rhythm of Borneo and others. All in, there will be twelve international and six Malaysian acts. For more information, you can visit RWMF Performers 2012. For a peek at what to expect, here's a video of last year's Rainforest World Music Festival. Enjoy! Friday Frolics - How Do You Color Your Life? Today is Friday the 13, and it's a good thing that people are not obsessed about its connotation, otherwise the world would come to a standstill every time Friday falls on this date. Can you imagine empty flights and empty trains? 13 or not, it's Friday today, so let's do another round of Friday Frolics, shall we? Take the quiz to find out how you color your life. I color it with Intense Warmth, it says. As for rating, I'd give it a 4. You are a down to earth, stable person. You can be relied on. You enjoy the outdoors. There's something about being in nature that makes you feel really blissful. While you are responsible, you aren't boring. You have a lot of flair and style. You enjoy creative projects of all sorts. You're a very visual person. "The Scream," Edvard Munch's masterpiece from 1895 depicting a bald figure with hands pressed to the head and swirling colors in the background, is one of the world's most famous paintings. Three other versions, including two that were stolen and later recovered, are in museums in Norway. This masterpiece has been sold at a Sotheby's auction for a record $120million! U.S. billionaire Leon Black is the mystery buyer who paid the record $120 million price. This is the most expensive work of art ever sold at an auction, according to the Wall Street Journal. Now here's a musical treat! If you are a fan of M. Nasir, a born in Singapore Malaysian poet, singer-songwriter, composer, producer, actor and film director, you wouldn't want to miss his upcoming concert, a collaboration with the Malaysian Philharmonic Orchestra (MPO). So far, only two local legendary artistes have collaborated with the Malaysian Philharmonic Orchestra, Tan Sri SM Salim being the first to work with the MPO in 2001, followed by Datuk Sheila Majid two years ago. And now M. Nasir. This fusion of two musical styles - the Nusantara fundamentals of his music and an orchestra - could be quite a musical experience. We can expect a DVD to follow, perhaps. Nasir’s 35 years in the music industry has seen him scale some lofty heights. The multi-talented artiste, who has a keen love for painting, received his Diploma in Western Painting at Singapore’s Nanyang Academy Of Fine Arts in 1978. He then went on to lead his band Kembara through four albums in the 1980s before striking it out on his own with the cheekily titled Solo album in 1989. To date, he has seven solo albums tucked under his belt and has also produced albums for numerous artistes. Nasir has garnered numerous accolades for his works in music and movies: Anugerah Juara Lagu (1990, 1991, 1993, 1994, 1999, 2000 and 2012), Anugerah Industri Muzik (2001 and 2002) and Anugerah Planet Muzik (2001); Malaysian Film Festival (1984 and 1990) and Anugerah Skrin TV3 (1997). The 20-odd songs expected to get the roll-call for the two-hour shows include gems like Kias Fansuri, Sahabat Gua, Apokalips, Juwita, Ghazal Untuk Rabiah, Andalusia, Bonda, Keroncong Untuk Ana and Mentera Semerah Padi. The choice of songs was not only of M. Nasir’s own preference, but also based on general consensus. The 100-plus member ensemble will also include two musicians playing the Malay drums and flute, respectively. 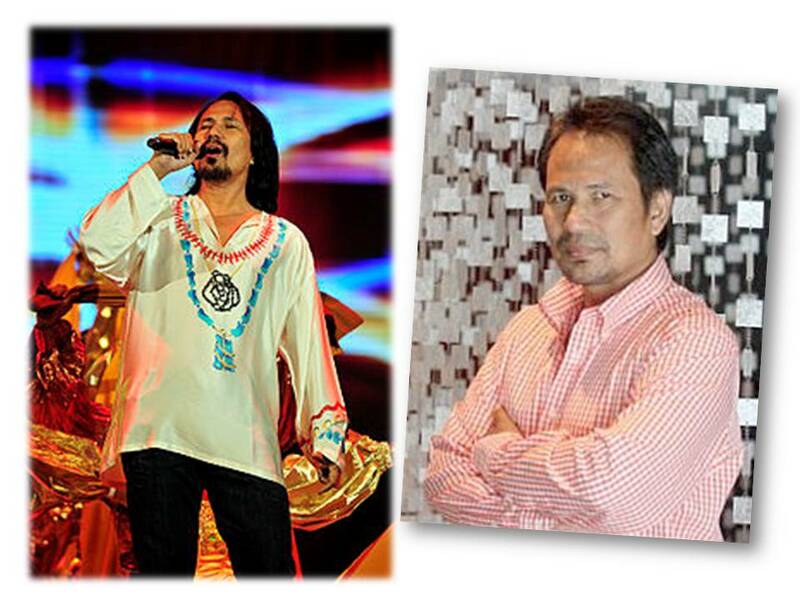 The shows to be staged at Dewan Filharmonik Petronas (DFP) on July 13 and 14, is aptly titled M Nasir & The MPO. M Nasir & The MPO showtime is at 8.30pm. Tickets are priced from RM98 to RM358. For more info, call 03-2051 7007 or visit mpo.com.my / dfp.com.my. This came in the mail today but original source unknown. What a sensible piece of advice, one which everyone can benefit from. Read on.. Following is a letter to his son from a renowned Hong Kong TV broadcaster/Child Psychologist. The words are actually applicable to all of us, young or old. All parents can use this in their teachings to their children. Life, fortune and mishaps are unpredictable; nobody knows how long he lives. Some words are better said early. What is written is based on my own personal experiences that perhaps could save you a lot of unnecessary heartaches. On the frontpage of The Star today is a picture of world number 2 shuttler, Datuk Lee Chong Wei, getting a feel of a whopping RM2mil gold bar which will be given to any Malaysian shuttler who wins a gold medal at the London Olympics. This is the carrot being dangled by the KL Racquet Club chairman, Datuk Seri Andrew Kam, in an effort to challenge our shuttlers to go for gold at the Games, which will begin on July 27. Should there be two gold medal winners, they will share the bounty. London-bound are six shuttlers who were present at the announcement ceremony held at a leading hotel here yesterday. The six shuttlers are Lee Chong Wei, who is realistically the man likely to win Malaysia’s first-ever gold medal (after bagg­ing a silver in Beijing four years ago), Koo Kien Keat, Tan Boon Heong, Chan Peng Soon, Goh Liu Ying and Tee Jing Yi. 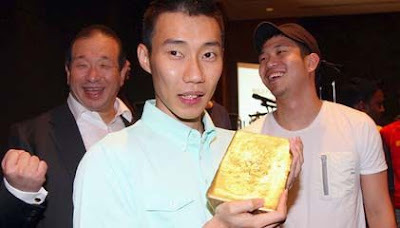 KLRC chairman Datuk Seri Andrew Kam showing the RM2mil gold bar to the national shuttlers (from left) Koo Kien Keat, Tan Boon Heong, Lee Chong Wei, Chan Peng Soon, Goh Liu Ying and Tee Jing Yi. On the right is OCM secretary general Datuk Sieh Kok Chi. The above incentive is in addition to the RM1mil offered by the Government and another private firm. The Government’s offer through the National Sports Coun­cil’s incentive scheme (first introduced for the Beijing Olympics), includes RM300,000 for a silver and RM150,000 for a bronze. Under the scheme, a gold medallist will also receive a lifetime pension of RM5,000 a month. A silver medallist will get RM3,000 a month and bronze medallist RM1,500 a month. 3V Holdings Sdn Bhd, a local furniture company, has also stepped forward to offer a RM1mil cash incentive to help boost the quest to win the country’s first Olympic gold medal in London. If there is more than one gold medallist, the purse will be shared. Should no one win a gold medal, the offer will be extended to the 2016 Olympics in Brazil. All the best, all Malaysian Olympians! It's so nice to go shopping without having to pay for it and I'm not even talking about using a debit card or a credit card. I'm talking about spending your reward points - but of course, you first had to spend the money before you are able to accumulate the points to spend them. The point here is, shopping without having to put up any payment upfront. Realtime. But before I go out and redeem one, does anyone already have one? How does the food taste like? I once tried making fish crackers in a microwave oven - no oil required - but they turned out blekkk! Never did that again. Fat-free is good and all but sure don't want to end up with a white elephant sitting pretty in some dark recesses of my kitchen cabinet. 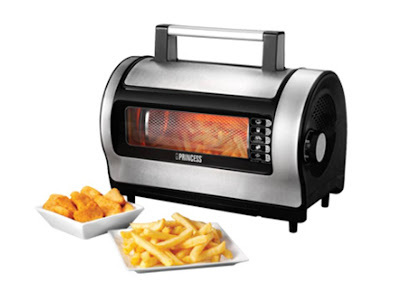 So, if you have such a fryer or know anything about it, how about sharing your experience(s)? Is it legal to buy pepper spray in Malaysia? Looks like pepper spray is legal now in Malaysia. This answers the often-asked question by women looking for ways to protect themselves from attackers. Read on..
PETALING JAYA: Size does matter at least when it comes to pepper sprays that can help women fend off assailants, said Kuala Lumpur CID chief Datuk Ku Chin Wah. He said many women were carrying pepper sprays nowadays as a form of protection and these could help in the event of multiple assailants. However, Ku warned that it was an offence to use a pepper spray on anyone for reasons other than self-defence. “There's no harm in carrying them. That's the least women can do to protect themselves from harm,” he said in an interview. Those who wish to buy the spray would have to register with the police database. However, Ku stressed that the sprays should only be used as a last resort to escape from confrontation. 1Malaysia Mega Sale Carnival is back! The city is bustling with shoppers. Perhaps the whole country is right now. We are into almost a month of the annual mega sale coined this year as the 1Malaysia Mega Sale Carnival. This year, the mega sale carnival started on June 15 and will be on for a good seven weeks ending on September 2. Expect great bargains and deep discounts everywhere in every shopping mall across the country. From designer wear to jewellery to home furnishing and everything else, big savings can be realised shopping at this time of the year. If you are looking for a chic cocktail dress or even a plus size prom dress, you'll be able to find what you are looking for and for a great bargain price too in this 1Malaysia Mega Sale Carnival. Happy shopping! ** If shopping is your reason for visiting Malaysia, time your visit to this time of the year. You won't regret it. In a few years time, a portion of Jalan Bukit Bintang in Kuala Lumpur will look different from what we know it today. 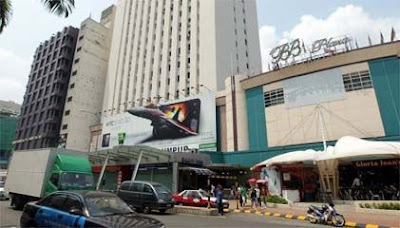 The iconic Bukit Bintang Plaza, built more than 30 years ago, will be demolished to make way for the Klang Valley Mass Rapid Transit (MRT) project. Tenants located outside the front portion of the complex have been informed to vacate by the end of the year as work on the MRT will begin early next year. Bukit Bintang Plaza is joined to Sungei Wang Plaza and both complexes appear to be one huge shopping complex in which there is no wall separating the two and shoppers can just walk across from one to the other. If you visit Kuala Lumpur, this is the part of the city you don't want to miss. Tourists and locals alike flock to this vibrant part of the Golden Triangle for shopping (major complexes in the city are located here), food (including Middle-eastern), entertainment (for the family as well). There are many hotels to cater to tourists, from 5-star accommodations to budget hotels. With the MRT coming onboard, this part of the city will be easier to access via public transportation. The existing monorail service currently only links certain parts of the city centre. The MRT will cover a wider reach including Chinatown which would save you a 30-minute walk from Jalan Bukit Bintang. Inflation being what it is, the amount of money we are saving for retirement may not be sufficient to sustain our daily living when the time comes. Investing money wisely to protect the purchasing power is no longer an option but a necessity. With bank rates at what they are, a diversified investment portfolio that includes gold investment and annuity rates fixed income accounts are two better options for retirement. From what I see, rates offered on annuity accounts are twice as good as rates offered by banks and there are many different types of income annuities, one to suit every need. 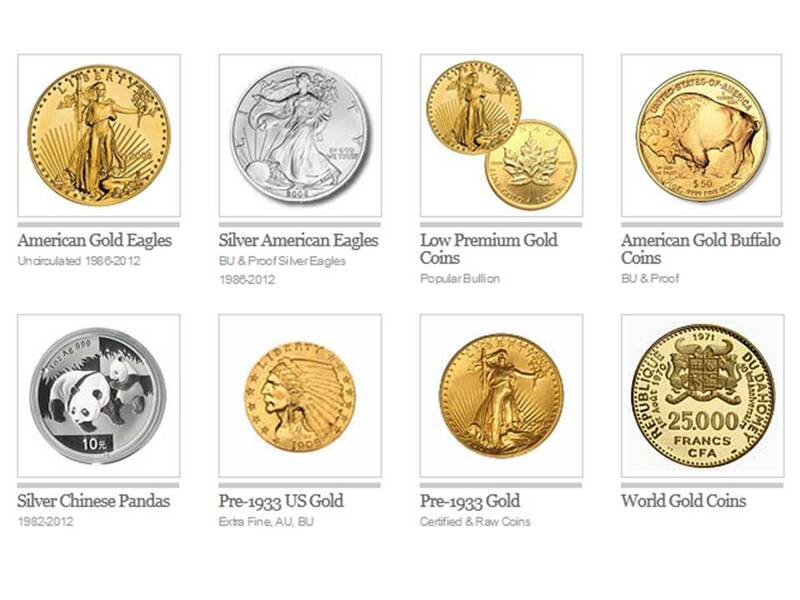 Investing in gold is another sure way to combat the negative forces of inflation. Collectors of collectibles will be happy to note that McDonald's is back again with their set of free CocaCola glasses. 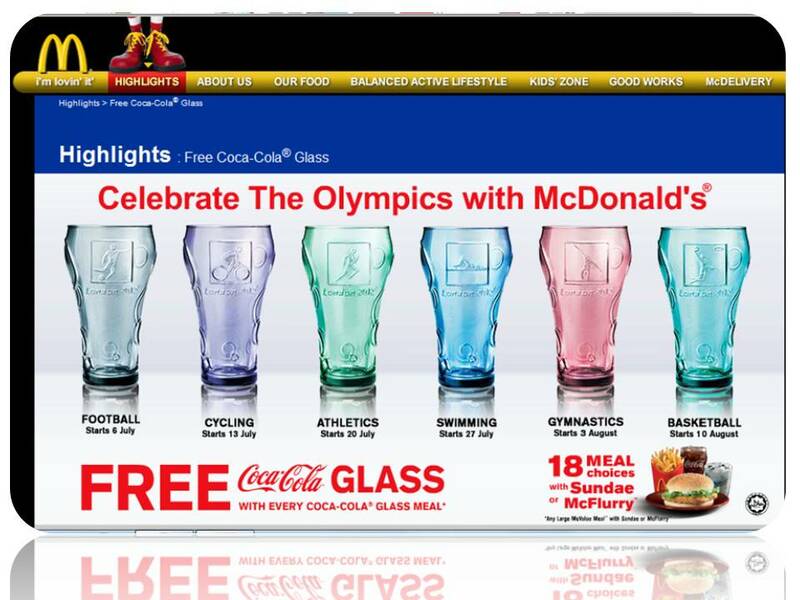 This time, McDonald's is celebrating The Olympics and they are giving away a free CocaCola glass with every Coca-Cola Glass Meal and there are 18 choices to choose from! And.. I've got the first Coke Glass. Yay! 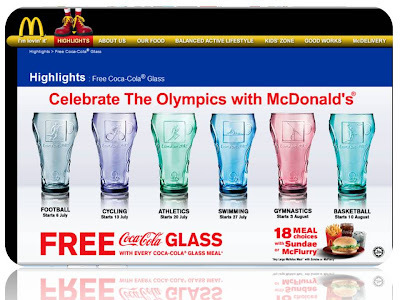 Unlike the previous set of McDonald's glasses, The Olympics set features six sports events that are being included in the summer games in London 2012. The first Coke glass which is grey/charcoal, features Football. This grey Football glass has been available since July 6 and will be until July 12, while stocks last, that is. 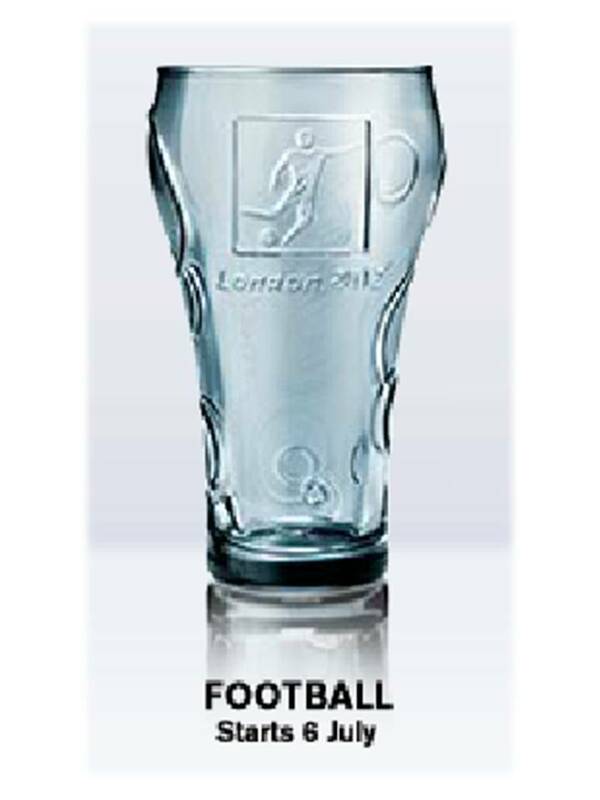 Embossed on one side of the glass (on the outerside), is an image of a footballer about to kick the ball and the words London 2012 below the image. The other side of the glass has the words "CocaCola proud partner". 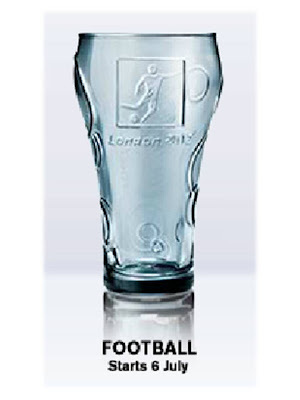 Here's an image of the first free CocaCola glass that features Football. The image at top of post shows the entire range of the McDonald's CocaCola glasses. Grab them while stocks last and from previous experience, they don't last long. You know what I mean. Happy collecting! ** All of a sudden I was thinking collectors in Johor Bahru would have some buying-competition from collectors across the Causeway. A fractured bone resulting from a misadventure is a bane to one's mobility. A colleague limped into the office on crutches this morning and got everyone excited all wanting to know how he sustained his injuries. A rough tackle at a soccer match over the weekend brought on a fractured foot. He is with a football team in a state football league. Crutches are quite troublesome to use and may cause a fall from the lack of balancing. A knee-walker is a better alternative. A roll-a-bout knee-walker provides more comfort and less of a hassle to use. A knee-walker may cause a storage issue when not in use but the good news is, knee-walkers are now available for rent and for a reasonable rate too - no worries about storage and easily available when needed. A win-win! Friday Frolics - What Kitchen Item Are You? This Friday's personality quiz has something to do with the kitchen. Nevermind if you don't cook, we're just talking about kitchen items. It says here I'm a Rice Cooker. I wonder what other kitchen items are there. Find out what you are..
As for rating, I'd give it a 3 as far as I know..
You are elegant, withdrawn, and brilliant. Your mind is a weapon, and you're able to solve any puzzle. You are systematic and calculating. Once you find something that works for you, you don't stray from it. You are rather unemotional. Your logical side is dominant. 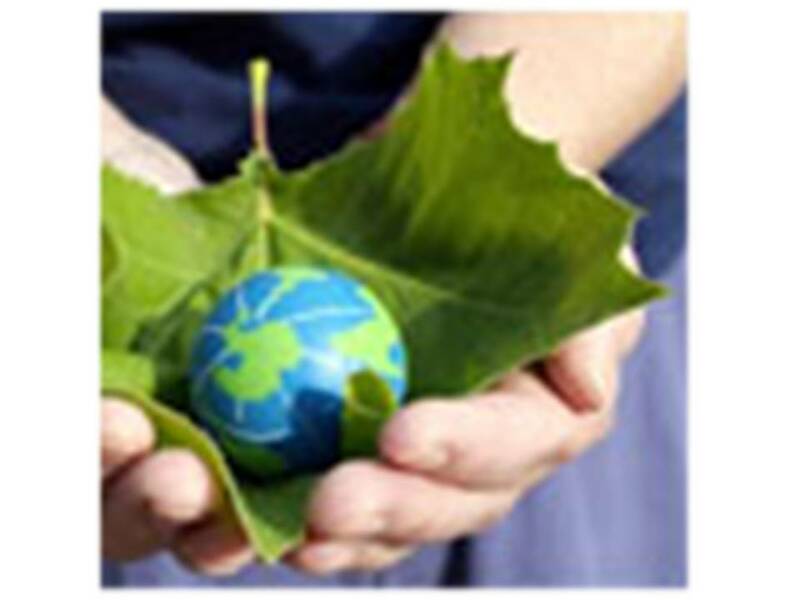 When it comes to going green to help save the environment, there are many ways we can go about it. If you bring your own shopping bag shopping, that is one way you are helping the environment. Recycling and reusing stuff are other ways. There are lots of things we can recycle and/or reuse or avoid using so that less goes into landfills which takes years to biodegrade or worse, never will. Technology is helping in the right direction. By making electronic payments instead of writing out a cheque, for instance, you help save trees. Electronic payments are not only convenient, they also prevent you from exposing personal details of yourself, including your name, bank account number, signature, all of which a cheque carries. Bottomline, electronic payments are safe, smart and environmentally-friendly! Good news for motorists who are using RON97 petrol as the pump price of RON97 has been reduced by 20 sen beginning today, July 5. The new price per litre is now RM2.60. The reduction is due to a drop in the average global oil price. Unlike RON95, RON97 is not subsidised thus the price fluctuates according to the market. The last adjustment was a month ago on June 6 in which the price dropped from RM2.90 to RM2.80. The price of subsidised RON95 remains at RM1.90 a litre while diesel is at RM1.80 a litre. However, a few days ago, the Prime Minister said that the Country can't run on fuel subsidy forever. 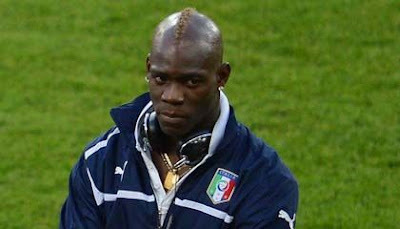 One can't help reading about Mario Balotelli when he appears in the papers. His antics sometimes boggle the mind, to say the least. But this time, it's praise-worthy and responsible of him. Manchester City and Italy football star, Mario Balotelli, told Italian press Wednesday that he will take a paternity test after he found out that his former fiancee is pregnant with his child. Advancement in medical science has enabled a pregnant dna test to be risk-free and accurate. It is also non-invasive and is safe for both mother and baby. 21-year-old Balotelli in a statement said that he will assume full responsibility once it's been proven that he is the father of the child. He's disappointed that he had to learn about the pregnancy from third parties. Raffaella Fico is a 24-year-old television celebrity and underwear model. She is four months pregnant. The couple’s 18-month relationship ended in April. Today is a lovely day out there. No complaint. We have to thank our lucky stars that we are just battling the haze here in our country, and that too is only intermittently. Out there, people are fighting wildfires in Colorado, unrest in many parts of the world including in Timbuktu where there are tomb attacks, or in Syria where patients at a military hospital in Syria were killed by "custom injections". 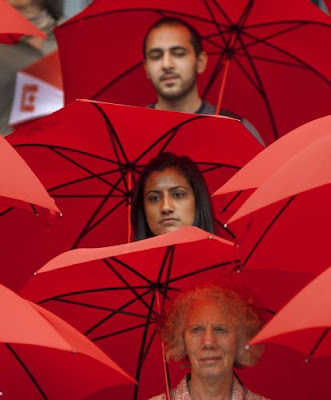 What about the Eurozone crisis that is causing unemployment rises to record high 11.1%. And more.. The article added that more than half the infected birds have died or been culled, the agriculture ministry said of an epidemic that was confirmed on Friday by the UN's Food and Agriculture Organization (FAO). The outbreak was first detected on June 20. On Friday, 1.7 million birds had been contaminated and 870,000 had died at 10 breeding farms in the western state of Jalisco as reported by the FAO. The emergency was declared on Monday and include provisions for quarantine, slaughter, vaccination, and the destruction of infected products. Poultry farming contributes up to 40 percent of the total volume of the country's livestock production. Wherever you are reading this, I pray you are safe and well. How many of us are suffering or have suffered from shoulder aches due to working long and hard at the computer either at home or in the office? Ergonomics is defined as the study of designing equipment and devices that fit the human body, its movements and its cognitive abilities. If ergonomic principles are observed, the practice will help in reducing risk of developing a repetitive strain injury and other stress-related injuries. 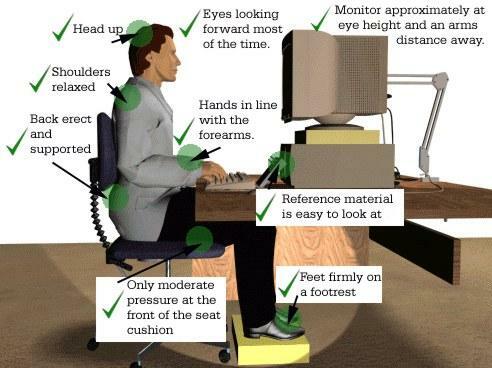 There is a lot more to ergonomics. The Internet is a wonderful resource for more information. Suffice to say that the right type of computer desks with regard to height and so forth, could help in complying with the principles of ergonomics in turn preventing physical stress to the body.